Will Dockery mentioned Phil Ochs in the Billie Holiday thread. That mention reminded me of a thing I recently discovered. Ochs started recording in 1964, so this discussion is just off-topic, but please indulge me. Some of you know that I like to explore the history of the university that I graduated from. I knew that Phil Ochs was an alumnus, and When I learned that he had been a journalism major I went looking for anything he may have written for the student newspaper. "Thurber's effect stems from his association with common sentiments and everyday experiences with which his audience can identify. The material teases the audience without preaching; it is sophisticated enough to chide without provoking. Thurber's genius was a product of his deep insight into mankind, and his humor was a product of his deeper love." This review got me thinking. To what extent did Ochs's own work live up to this value, to "tease without preaching" and "chide without provoking"? Bob Dylan, after all, later criticized Ochs for being too politically strident. Roman's dull but boring dreck eats away the collective brain of the room once again!!! Why would you put a "but" in between "dull" and "boring?" songs on the lp are mostly non-political. Yep, I always loved this cover shot, Bobby. link. I was just trying to find a good sized picture of the cover. "50 Phil Ochs fans can't be wrong!" Hey, that's 50 times more fans than you! You shouldn't count him as a fan. I was figuring his mother. Far be it from me to compete with the late great Phil Ochs. "Folk singer Phil Ochs (1940-1976) talks and sings about the 1968 US election that brought President Richard Nixon and Vice-President Spiro Agnew to power. The song was part of Ochs' ironically titled album Greatest Hits, which was not a compilation but rather a collection of new songs. 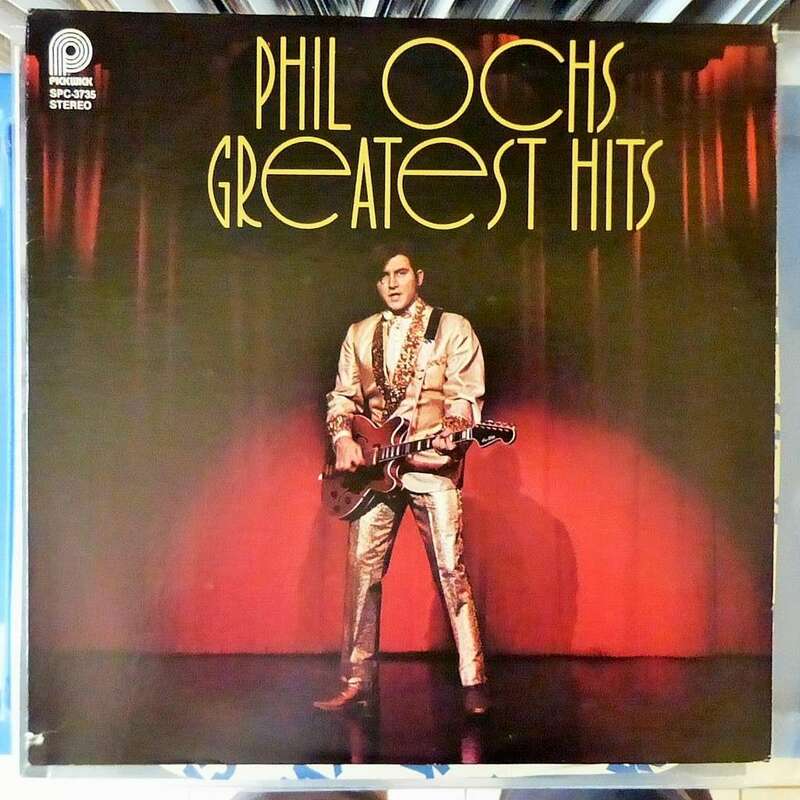 The album was was packaged to look like an Elvis' Gold Records compilation, including Ochs donning a gold lame suit and the subtitle "50 Phil Ochs Fans Can't Be Wrong", a reference to the subtitle of the second Elvis' Gold Records compilation, '50,000,000 Elvis Fans Can't Be Wrong'..."
Ochs was a pathetic Bob Dylan apostle who was crushed when the great one wouldn't give him the time of day during his last decadent years!! Why would Dylan throw him a bone? Other than "Changes", I can't name one Phil Ochs tune that I've deliberately heard more than once baby!! Give me Lightfoot and Tom Hardin anytime, baby!! So, you don't like the music of Phil Ochs... ome of us do. Some people like Phil Ochs and some people like stomach cramps!! native of Queens, didn't grow up here, but he did die here. "Small Circle of Friends" bubbled under. Neither did Thurber for that matter, but the school still claims him. Both left (and took off to New York) without finishing their final exams. Maybe Ochs was explicitly patterning himself after Thurber, just as Thurber had explicitly patterned himself after the painter George Bellows, who also left (and took off for New York) without finishing his final exams. They do all fit Merriam-Webster's definition. True, art is subjective, after all.